For some reason I thought I hated cherries. I’ve no idea what I tasted as a child that put me off them so much. Possibly those horrible glace cherries from the Christmas cake mix. Recently my sister was eating a lovely bunch of fresh cherries and offered me some. Initially I refused but then thought, taste them again, you never know. And I loved them! So the moral of the story is to keep trying foods that you think you don’t like, our palates change all the time. So now that my preachy bit is out of the way, on to the recipe. I bought a batch of fresh cherries and wanted to make something sweet with them. Also, I got a gentle reminder while watching the Great British Bake Off that it’s been a while since I did any baking! I thought about a classic clafoutis but decided that would be a bit heavy. I do want to try this River Cottage recipe at some stage though. 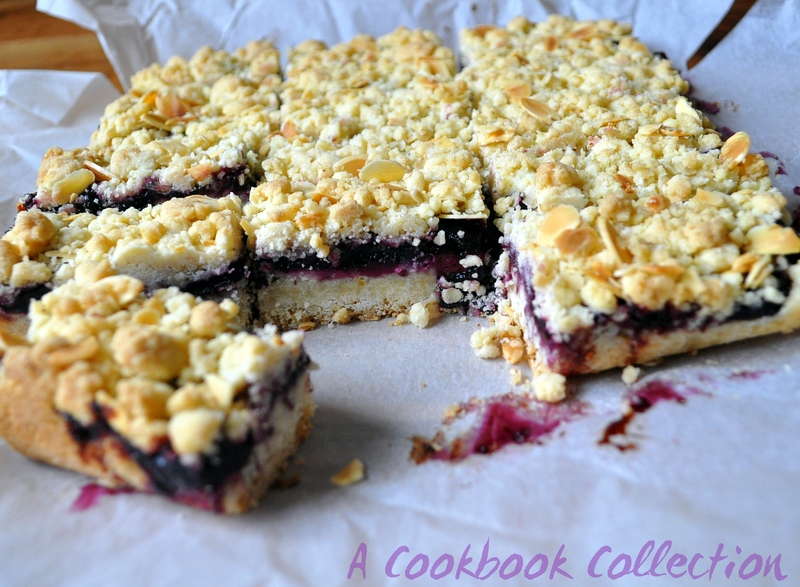 I came across a recipe in Anna Olson’s Back to Baking for Raspberry Crumble Bars and decided to adapt that. 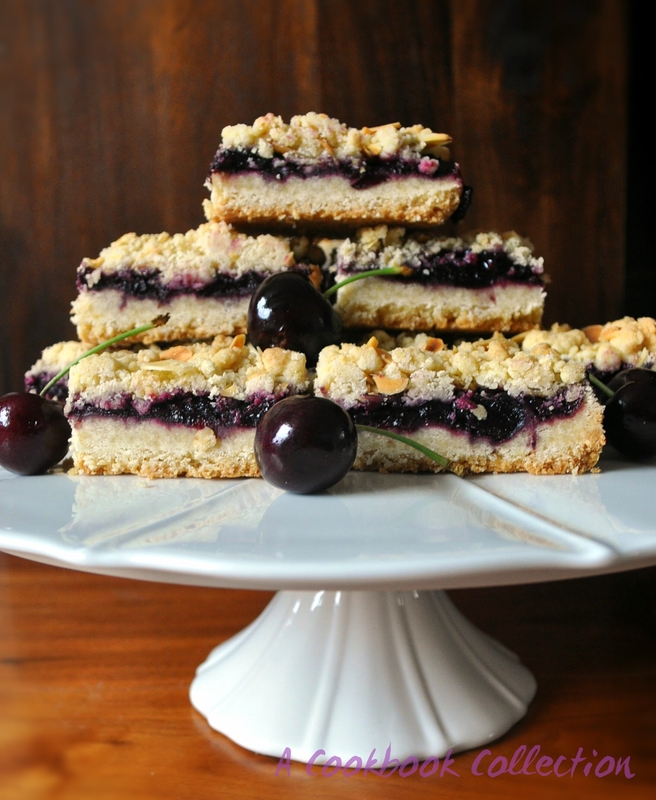 I added lemon, almonds as they work so well with cherries and oats for a different flavour on top. I used fresh fruit but you could use frozen, a pie filling or even jam as the fruit layer. I also like the addition of a cream cheese layer in this recipe on Brown Eyed Baker. I wanted something very simple so I left it out but will try it another time. You could substitute cherries for another fruit of your choice. These keep in the fridge for up to 5 days. On the day they are baked the based is quite hard and biscuity but softens overnight, so I actually preferred them the following day. Start by making the cherry filling as this will need some time to cook. Put all of the ingredients into a saucepan over a high heat and bring to the boil, stirring regularly. Once it has started to boil, reduce the heat and simmer over a low heat for about 10 minutes until the cherries have broken down a bit, you don’t want them completely mushy, and the syrup has thickened. Set to one side. Preheat the oven to 180c/160c fan/gas mark 4. Line an 8″ square cake tin with parchment paper. Sieve the flour, cornflour, baking powder and salt into a large bowl. Add the ground almonds, caster sugar and lemon zest and mix it all well together. Cut the butter into cubes and rub it into the dry ingredients either with your fingers or cut it in with a pastry cutter or knife. Keep rubbing until the mixture resembles breadcrumbs. You could use a food processor for this but it is so quick by hand save yourself the washing up! 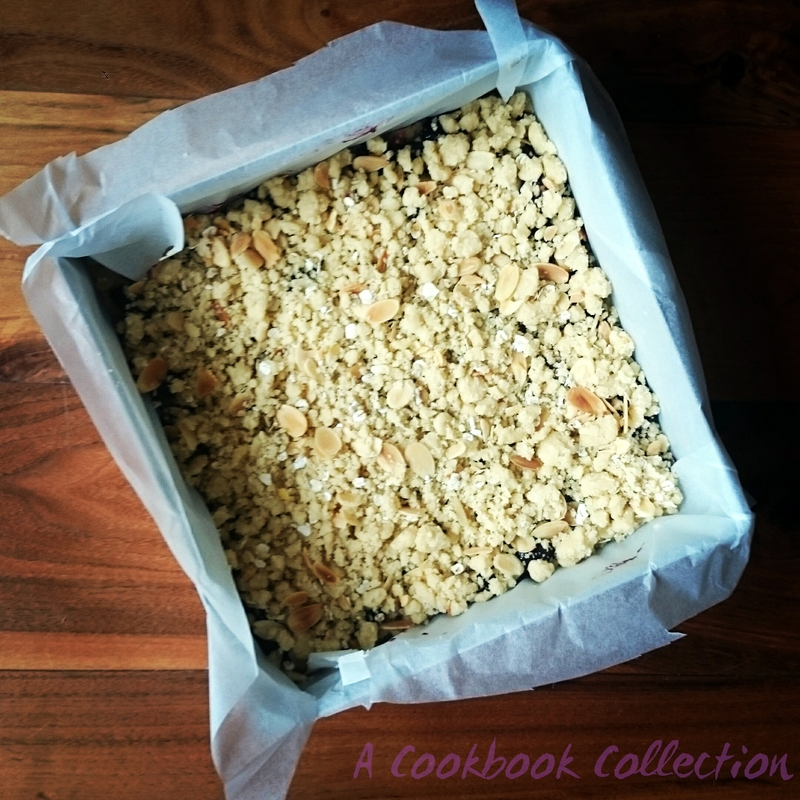 Take approx two thirds of the crumble mix and press it into the prepared cake tin. Use your fingers to press it in an even layer. Cover this layer with the cherry filling and spread it out as evenly as possible. Add the oats and flaked almonds to the remaining crumble dough and mix until well combined. Sprinkle this on top of the cherries. Do this as evenly as possible and press it gently into the tin. Bake for approx 30 to 35 minutes and take it out of the oven when the topping has turned a nice pale golden brown colour. Allow to cool in the tin and then transfer to the fridge for 2 hours to set before cutting into squares. These look wonderful! I have a new love for cherries that I didn’t know existed. Did you use sour or sweet cherries? Thank you Debbie, it means a lot coming from you! I used sweet cherries, I’m not sure I’m ready for sour cherries just yet. Oh, my God. Delicious. But I’m afraid I might have put on 2lb just by reading this recipe. Still, it was worth it. Thank Blog for that, you had me worried. Top class. I love the last shot with the bars and cherries. Thank you Vajeea, that’s very kind of you!